So why was I here? Holding this sign? Despite not having any Scottish blood? Because I believed in what the Scottish people were trying to do. They were trying to govern themselves. They were trying to ignore the collective wisdom of the world who screamed that money was the primary value by which they should judge this referendum, which would be one of the most important decisions of their lives. As an unreconstructed American, I'm always going to favor principles and tradition over popular notions. I've been following the referendum for over 12 months. I pay particular attention to British politics, because unlike American politics which is completely hopeless, British politics is done on a small enough scale and in a sensible enough manner that minority opinions can not only be heard, but can sometimes hold the balance of power. We've watched this in the rise of the Liberal Democrats and more recently, in the rise of UKIP. The vast majority of those in Britain ignored the referendum until a couple weeks ago, when one of the YouGov polls showed a slight lead for Yes, after No had held 20 point leads for months and months. Westminster panicked. It sent all of its clowns up to Scotland promising the moon. This despite the fact that these powers were never on offer prior to the poll in question, and despite the fact that Alex Salmond had asked for "Devo Max" (the British like shortening everything. 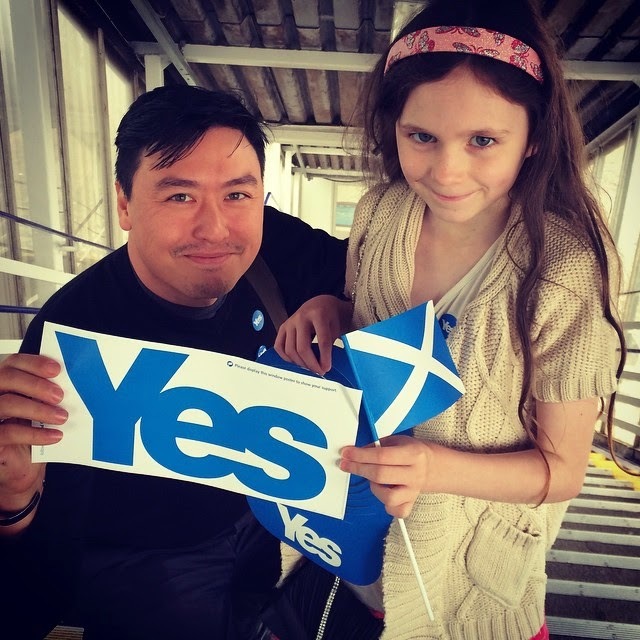 The hashtag was #indyref and David Cameron's wife is SamCam) which was short for "Devolution Maximum" which would have been as many powers given to the Scottish Parliament as possible. Years ago, David Cameron blocked this maneuver, and we were left with a "Yes/No" referendum (though he stupidly, in terms of strategy, allowed the independence side to have the "Yes" when he could have worded the question to be, "Should Scotland stay a part of the United Kingdom?" The No Campaign learned early on that it's hard to run a positive campaign with the word "No."). Three months ago I decided I had to be in Scotland for the vote, even if the polls were so far apart. It was a day for secession, and as someone who had an "originalist" understanding of America*, it was an incredible sight to see secession in action - even just the sheer possibility of it. I couldn't have predicted how close it would be and how much excitement I would witness - and how low I would feel - today - the day after Scotland chose "No." Why was I a "Yes"? Dozens of reasons. Let me share just a few, and start with the most important one. I believe in small government, and in the principle of subsidiarity, as outlined by Pope Leo XIII, of happy memory, in Rerum Novarum. The principle is a sensible one: nothing should be done at a higher level which can be done at a lower level. Small government is more accountable and can be changed more easily. Now - it will be argued that the SNP is a social democratic party, and hence is "big government" in the way it spends and behaves. But it is inevitable that a country that is the size of South Carolina, a state which was the intellectual home of secession in the United States, would necessarily have to be more accountable to its citizens simply because of its size. If it wanted to act in a "big government" way, it would be because its denizens wished it to be so. The Westminster system is absolutely corrupt and broken. The way the UK was put together was so hodgepodge that Wales isn't even represented on the official flag of the "united" union of nations. Scotland's possible breakaway meant that not only was the status quo found wanting, but was actually under clear and present threat. Anyone watching the sheer panic of the normally smug suited classes of London told you everything you needed to know about what Scotland's breakaway would signify for sterling, the international standing of the country known up to that point as Great Britain, and the reality of governing what would be a rump of what was once the empire on which the sun never set. Americans can only dream of such a referendum. The last time they attempted to peacefully leave (convening constitutional conventions in each state, and then formally withdrawing from the union) they were invaded by "American" forces who would later craft a narrative that they were fighting for "freedom" when they were really invading another country to exploit their economic resources and because they were "morally superior." If you ever wonder why America feels the need to invade other countries based on a God-given mission, it's because it believes the lies it told itself about the horrible, terrible South. You could tell who had never owned or run a business by how much they threw the word "risk" around. We saw ridiculous white papers from places like DeutscheBank. Yes, of course there will be risk. There's risk in almost anything important in life. The question was (and is, frankly) whether the risk of staying with the UK was more detrimental to Scotland's future than leaving it. I think that in the short and medium term (because the long term is impossible to predict in anything, not just the life of nations) the answer is that Scotland would be better off alone: governing a small nation, with innovative social and business policy, backed by oil and green energy, with alliances with Europe and England as she saw fit, not as everyone crowed she would or would not obtain. Sean Connery penned an editorial the day before the referendum in which he stated that there is "no more creative act that creating a nation." What excitement there was! What would happen with Trident? Jobs? Taxes? A post office? Defense? The EU? Yes, there were questions, and yes, there was an army of BRILLIANT Scottish people not only skilled enough to tackle these difficult (you would think them impossible, if you believed the No campaign) questions, but who had a stake in the success of such decisions, unlike Westminster politicians who are there for money and benefits, before they leave to join the private sector. What I witnessed in the final 72 hours before the vote was like nothing I have ever seen in my life in any country leading up to an election: pure electricity. All of Scotland was on fire - everyone was talking about it. I talked with people in the airport and on the plane on my way to Scotland. The customs agent who stamped my passport asked me about it. Many friends who saw, via instagram, that I was now "on the ground" asked me how things were. My cabbie - my host family. The people on the street - the people in the shops. Everyone was talking about it. No one was angry. Except the No people. And by that I don't mean violence in the streets. I mean just the scowls from the older people, who came out in droves for the No campaign, who saw my Yes stickers and assumed I was some uppity youngster who wanted to steal their pensions and was voting Yes because I had been watching Braveheart on repeat for the last 7 days. The No people were nowhere to be found. They quietly went about their business and did as Scots have for the 300 years since the Act of Union in 1707: kept their head down, worked, and were happy to live their lives and let someone else take on the burden of governing. The No people didn't talk with the thousands and thousands of unpaid Yes volunteers who were smiling and engaged in the days leading up to the election. I talked with many of them - and they were from all walks of life - ignoring the lies of the No campaign and believing in themselves as humans and as Scots. The "play it safe" crowd won. And they will get nothing from Westminster. The ones who truly believe they will either a) know nothing about how the Union is run and what blowback is coming from Wales and England because of devolution or b) they ACTUALLY believe the lies of Tories and their fellow-traveler politicians who couldn't be bothered to come to this beautiful country until the final weeks of a 2-year campaign, when it looked as if their entire world was at risk. The play it safe crowd have nothing to rue. They don't want change, and they won't get it. I shook my head as I heard Alistair Darling un-ironically say that a "vote for no was a vote for change." It wasn't. Indeed, today I commiserated with the heartbroken Yes voters who had, in millions, come out for independence. The media will paint this as the "inevitable conclusion" but the BBC operated as a unionist shill throughout this campaign, and the real question ahead is what will the young and hopeful and bright and happy Scots I met in these last days do next? The most powerful possible instrument was taken from them by their own countrymen. And that's a hard thing to carry and accept. But they will. And they shall. Because Scotland is and always will be, a great nation. *prior to 1861 it was everywhere accepted as a fact/reality in America that the States had pre-existed the federal government, and indeed, had created the federal government as a creature to administer foreign policy, to coin money, and to plan for the national defense. It was an invention of the States, and ostensibly, subject to them. Post 1865 and the Lincolnian Revolution, America became (and is, alas, to the present day) a unitary state with borders separating different parts of the country, a Frankenstein that threatens not only the local villagers (the states who now can do little without federal approval) but the whole world (America is at once the stabilizing policeman and the destabilizing bully).